Pittsburgh dominated the line of scrimmage on both sides of the ball, so Conner was running through some big holes, but he was also picking up a lot of yards after contact. DETROIT — James Conner was almost out of gas by the end of the Little Caesars Pizza Bowl, but he knew his team needed a couple more plays. So. in the final minute, he shrugged off an offensive lineman’s hold and chased Bowling Green quarterback Matt Johnson out of bounds. On the next play, his pressure helped Pittsburgh All-American Aaron Donald sack Johnson — a play that clinched the Panthers’ 30-27 victory. "I was pretty tired, but I wasn’t going to tap out," Conner said. "I wanted to help us finish off this win, so I was going to go get the quarterback." The freshman had a pretty good excuse for his exhaustion. By the time he was chasing Johnson around as the clock ran down, he had already put up 229 yards rushing and a touchdown as Pittsburgh’s featured running back. "Coach told me after our last regular-season game that they wanted to unleash me on both sides of the ball," said Conner, who was an All-State player at both positions in high school. "They wanted me to play some defense, and I was all for it. Anything to help the team win." That has meant double duty for Conner in practice as well, so he was prepared for the extra snaps against Bowling Green. "I’ve been getting a lot of offensive reps and a lot of defensive reps in bowl practice, so I was ready to go," he said. 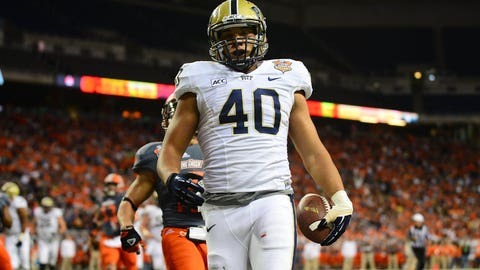 Conner didn’t even come into the game as Pitt’s number-one back — Bowling Green was expecting to see him in short-yardage situations — but he ended up shattering Tony Dorsett’s school record for rushing yards in a bowl game. The Heisman Trophy winner had 202 yards as the Panthers clinched the 1976 national championship by beating Georgia in the Sugar Bowl, so Conner’s achievement wasn’t quite on the same national scale. "It’s awesome just to be mentioned in the same sentence with a player like that," he said. "I wasn’t thinking about records, though. I was just running the ball. They kept giving it to me, so I just had to keep going." "We had seen him on film, so we knew he was a big guy, but we weren’t expecting him to be breaking tackles downfield like that," said Bowling Green defensive back BooBoo Gates. "There was one play where I tried to tackle him, and he just ran right through my arms. I was like ‘whoa." Pittsburgh coach Paul Chryst tried to play down Conner’s performance, but it wasn’t easy. "He’s just a freshman, so I want to say that he only had a good game," Chryst joked. "He’ll be the first one to tell you that he didn’t do that on his own — he had a lot of help from his offensive line and fullbacks, but he was the one getting all those extra yards downfield. So yes, I have to say that was one heck of a performance." Conner wasn’t the only freshman who had a big game for Pitt — Tyler Boyd had 173 yards receiving and a 54-yard punt-return touchdown — but even Conner had to share the spotlight with Donald. The senior, considered college football’s best defensive lineman, disrupted Bowling Green’s offense all night. Because of his presence, the Panthers finished with seven sacks and 12 tackles for loss. "We were double-teaming him almost every play, and we triple-teamed him a couple guys, but he just kept shedding guys," guard Dominic Flewellyn said. "His pressure up the middle was making Matty Jo shift to one side or the other, and that freed up their ends to make plays." Pittsburgh has a pretty solid platform to build on for next season, especially on the offensive side of the ball. Not only will Chryst have Conner and Boyd coming back for their sophomore seasons, but freshman quarterback Chad Voytik played the second half against Bowling Green and looked comfortable as both a runner and a passer. Replacing Donald, though, will be Chryst’s biggest challenge. "We obviously feel like we have a lot of young talent on this team, so we are excited about going forward," he said. "But we’re also losing one of Pitt’s all-time greats. It’s tough sitting here, knowing this is AD’s last game. He’s not the kind of player when you can just plug in another guy." Conner is going to be a key player on offense next year, but will Chryst be able to avoid the temptation of using him both ways on a regular basis? "I don’t know," he said. "He was awfully good tonight."